With those sharp claws and that scaly skin, these creatures may look pretty tough. But they are in major trouble. Here’s why—and how people are trying to help. Little Gung-wu snoozes contentedly in a caretaker’s hands. The baby pangolin (PANG-guh-lin) was born to parents that were rescued from poachers—people who illegally caught them. The poachers did not take good care of them. Once the parents were rescued, they were taken to the Taipei Zoo in Taiwan, an island country in Asia. There, zookeepers nursed the sickly pangolins back to health. Soon after, the mother gave birth to little Gung-wu. But the baby wouldn’t drink her milk. So caretakers stepped in to raise the tiny pangolin. As you can see, little Gung-wu is now in good hands. A quick glance at a pangolin will tell you it’s one of a kind. It’s the only mammal covered in hard scales made of keratin—the same stuff that makes up your hair and fingernails. When it’s threatened, it rolls into a ball to protect its soft underbelly. Rolled up, it looks more like an artichoke than an animal! The toothless pangolin eats almost nothing but ants and termites. It slurps up the insects with a sticky tongue that may be longer than your forearm. There are eight different pangolin species. Some live in Africa, and the others, in Asia. Some live mostly in trees, and others live mostly on the ground. But they’re all in trouble. Some people like to eat their meat. Others believe that their scales can be used to cure diseases. (They can’t—they have no more healing powers than your fingernail clippings!) But people are willing to pay a lot of money for pangolin scales and meat. So poachers catch or kill many thousands of the animals every year. Luckily, some people are trying to save these amazing animals. When poachers are caught with live pangolins, the pangolins are often turned over to local rescue groups. The Taipei Zoo, where Gung-wu lives, has been caring for pangolins for more than 30 years. Other groups offer food and medical care for rescued pangolins until they can return to the wild. 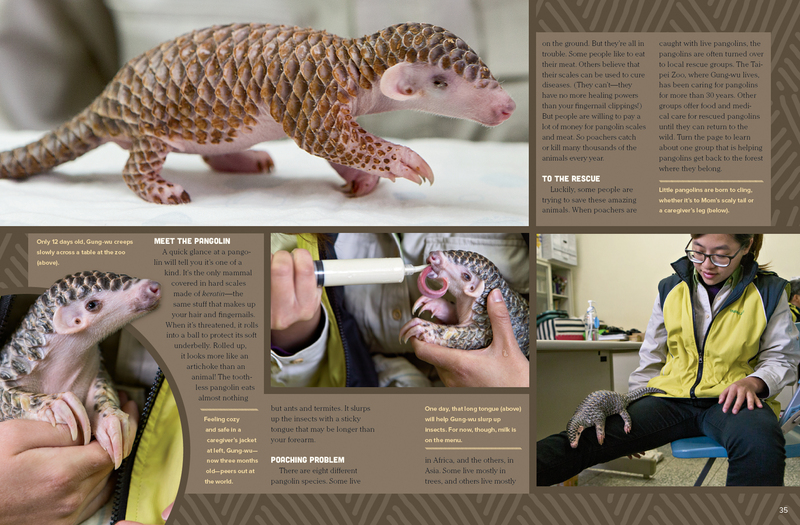 Turn the page to learn about one group that is helping pangolins get back to the forest where they belong. When a pangolin is rescued from a poacher, it’s often injured or sick. So it can’t go right back to the wild. And many wild places aren’t safe for pangolins anymore. So there are groups that take in the pangolins and nurse them back to health. Then they return them to parts of the forest where they will be safe from poachers. Most pangolins that are caught by poachers are sold in China or Vietnam. In Vietnam, a group called Save Vietnam’s Wildlife (SVW) has rescued hundreds of pangolins from these poachers over the last 10 years. Just last summer, the group returned 50 of them to the wild! That may sound like good news, and it is. But it’s also a sign that more and more pangolins are being caught illegally. So groups such as SVW are trying to spread the word that a pangolin’s place is in the forest—not on a dinner plate. 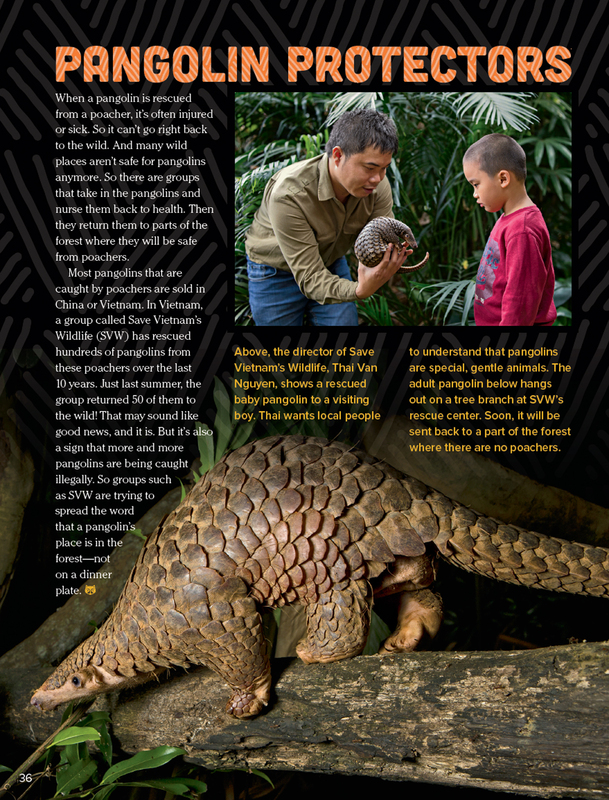 Above, the director of Save Vietnam’s Wildlife, Thai Van Nguyen, shows a rescued baby pangolin to a visiting boy. Thai wants local people to understand that pangolins are special, gentle animals. The adult pangolin below hangs out on a tree branch at SVW’s rescue center. Soon, it will be sent back to a part of the forest where there are no poachers. 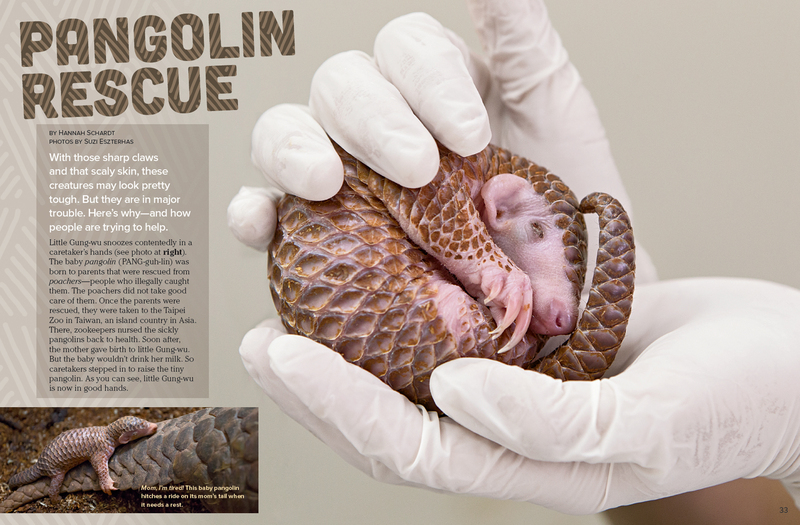 “Pangolin Rescue” originally appeared in the June/July 2016 issue of Ranger Rick magazine.